After February and March's declines for the S&P 500 I have to say it was good to see a bit of relief in that department. The S&P 500 increased 0.27% during April and likewise my net worth showed a tick up as well thanks to the markets, dividends and most importantly savings. During April my net worth increased $7,369.50. It sure was great to see the net worth climb higher after the two months of declines. Hopefully this will be the start of a new streak of monthly increases, but only time will tell since the movement in the markets will still play a large role in that. For the month my net worth increased 1.38% and thus far in 2018 my net worth has climbed 1.54%. 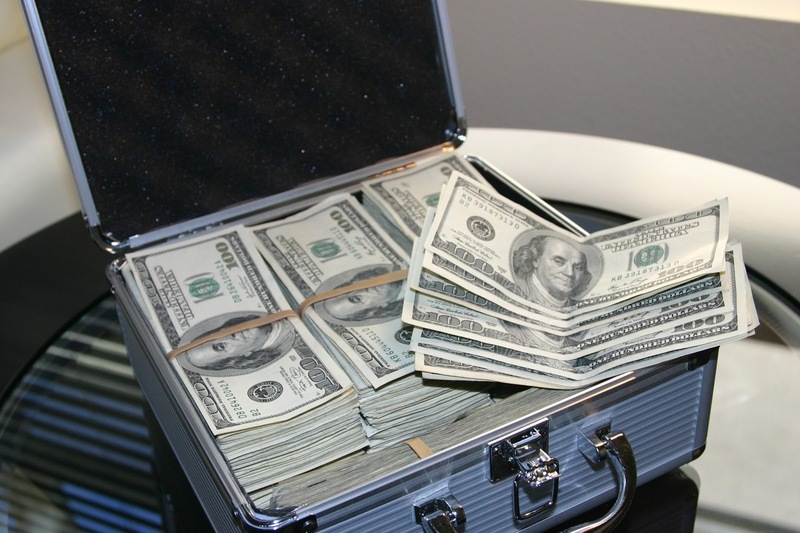 With taxes now behind us, and a fairly solid refund, we're now going to swap into cash hoarding mode until we get about $10k of cash on top of the expenses that we know are coming up namely 2 vacations. Then it's full steam ahead with debt pay down. A rough estimate would likely see the non-mortgage debt gone sometime in Q4 of this year and then it'll be back to savings and most importantly investing. At this time I don't see much reason to pay extra on the mortgage given our relatively low interest rate as well as the tax break on mortgage payments and think we'll come out much further ahead investing the extra cash flow. Actually I'm considering trying to do a refi sometime during Q2 or Q3 but time will tell on that since interest rates are moving higher. So the liabilities side of the net worth equation will be slow moving. However, once the FI portfolio is able to get to a self-sustaining level of dividends then the plan is to aggressively pay down the mortgage. 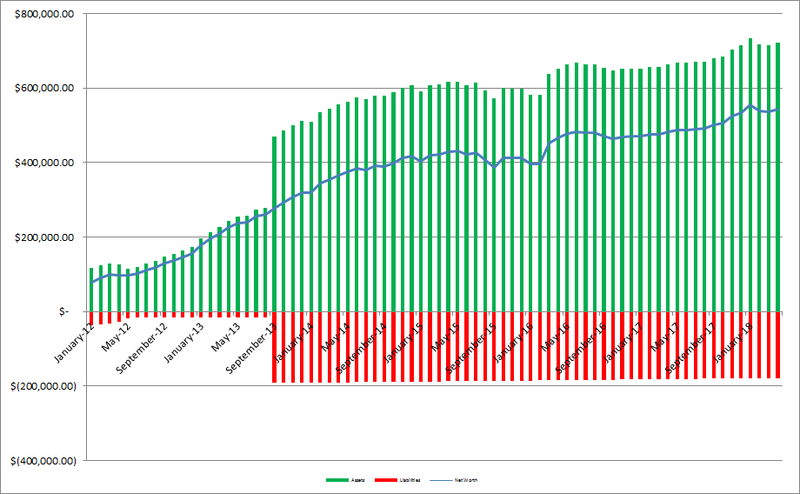 As of the end of April we have 26.2% equity in our house based on our purchase price from 2013. However, according to Zillow our house has increased in value around $43.1k from our purchase price which is a nice bonus, although I keep the purchase price as the value in the net worth equations. 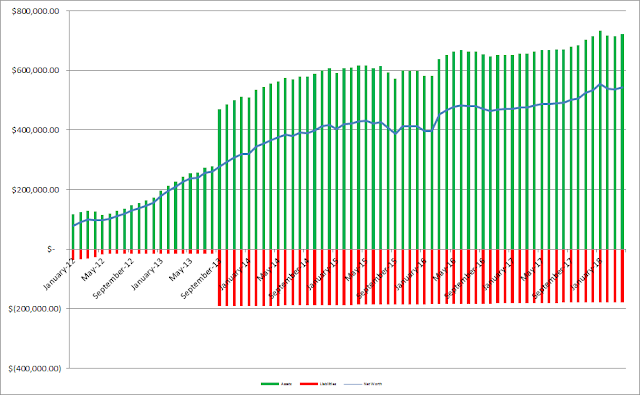 Based on Zillow's estimate the equity in our house is 38.4% thanks to the appreciation. Since I write so much (or at least try to) about investigating companies as an investment I figured it'd be fun to see how our balance sheet looks. 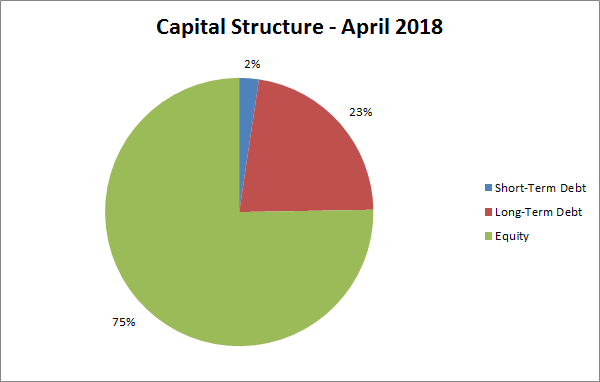 As of the end of April our debt to equity ratio is 33% and our debt to total capitalization is 25%. Not bad, but I'd love to get that debt down to ZERO! 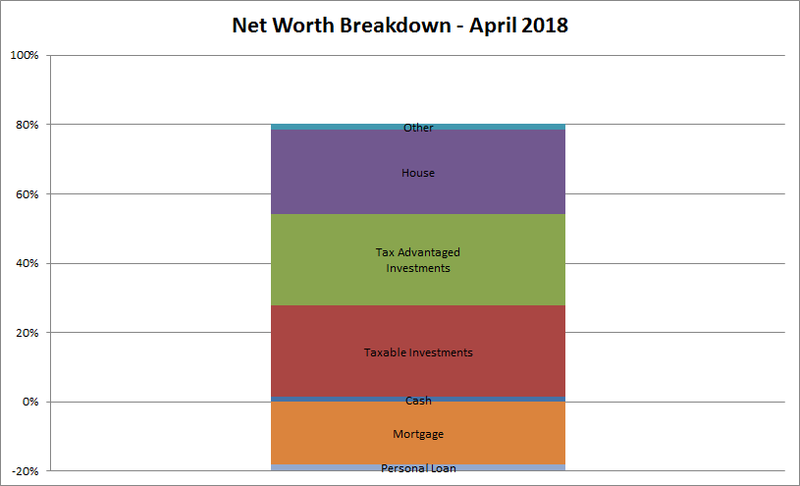 How did your net worth play out for April? Our net worth took a bit of a tumble then too, but we're moving in the right direction again thanks to solid savings and the markets recovering. That dividend growth sure does help too. I can't wait to see what June's total comes to. You're making really good progress, keep chipping away at that debt. I can't wait to be rid of the debt because it will free up so much monthly cash flow and best of all make it so there's one less thing to worry about each month.